The 900-seat church is typical of a church that has no acoustical management. The low ceiling fan shaped room had issues with standing waves, excessive noise from to many early reflections, and lots of bass stored in the corner. To complicate things more, the ceiling is parallel to the floor but the various levels of the flat ceiling helped – only slightly. As with most typical churches, carpeted floor and padded seating give the room the performance of the room being 50% full when it is empty. What is also typical is that the carpeting and padded seating do enough absorption above 2000Hz that adding more absorption panels to manage the lower frequencies would also mean killing the room even more for congregational signing and any hope for quality acoustical performances. With the reverberation above 2K already less than 1.4 seconds and the frequencies below 1K were almost 2 seconds, there were not too many options available. In this case, it was found that frequency specific diffusion would be the best way to go. The acoustic fix was mainly carried off with Tube Radiators supplied by CS Acoustics of New Hamburg, Ontario Canada. These are custom made half round diffuser made of thick wall compressed cardboard tubes that are skived and sealed. When installed properly, they do meet fire code requirement. The performance of the diffuser system was enough to reduce bass energy, midrange energy and eliminate standing waves. This would bring the overall reverb time down to an average of 1.3 seconds from 200 to 4000 Hertz, which makes it a great room for a Pentecostal type worship program. Short enough RT60 for a high quality contemporary worship service and live enough for great congregational singing. Eight and twelve inch diffusers were used in a detailed system to cut over 25dB between 200 to 800 Hertz. This design also absorbs bass energy down to 40 Hertz. Since most of the bass energy is diffused or scatter along the walls, there is no bottom end buildup in the corner and therefore no need for bass traps in the corners. This system makes it easier to hear that low note below 100 hertz. They come across as cleaner, clearer sounds at a lower volume. As a bonus you can feel more bass. After the acoustical system was installed, the musicians and singers all noticed a huge difference. Everything was easier. The 40-piece brass band found the room easier to perform in and the choir could hear themselves as never before. The minister found it an easier room to preach into as well. With the transformation of the room completed it was time to review the sound system. The existing speaker was old and they were not really speakers meant for installation work. Portable plastic speaker boxes are not really suited for fixed church installations. The options were limited. The ceiling was too low for any type of line array system, so it was necessary to stick with well-controlled brute force full range boxes. With the drop ceiling and limited suspension points, the lightest boxes than can move air the best were at the front of the line. Being familiar with a number of speaker brands, a not so well known speaker brand call KV2 Audio was brought to my attention. They are speakers that is designed, tested and built in the Czech Republic. Like all speaker manufacturers, they all have their unique story as to why their speakers are so good. KV2 Audio is no different. However, in the selection process, it came down to weight, size, speaker design and sonic performance. Speakers with horns that crossover below 1000Hz always move to the front of the line. In this case, the ES1.0 speakers have a horn crossover at 500Hz – which means better gain before feedback by default. When you have a low ceiling, directivity control is very important. Not because the acoustical treatment was not good enough but because of the proximity of the loudspeakers to open microphones on stage. When loudspeakers are within 15 ft of open mics and you are trying to mic a choir, you need speakers that are well controlled and these speakers have that kind of control. What is also helpful is that the ES1.0 is a Three-way speaker. Most three-way speakers tend to be heavy but the ES1.0 is only 74 pound or 34kg. While this is 3 pound lighter than a favorite 2 way speaker I have often recommended in the past, this 3 way speaker does have a superior quality sound when driven with their proprietary amplifiers. For this installation, we had a 600-pound weight limit that could be suspended from the roof that included the truss system, lighting and the full speaker system that included the Subs and two foldback speakers. The KV2 Audio “Less is More” truly hit the mark on this. The other detail was speaker size. The church didn’t want speaker to hang lower than what they had before. Most speakers that have crossover points below 1KHz tend to be very large boxes. Some over 40 inches tall when you get closer to a 500Hz crossover. Here, the ES1.0 is only 27.5 inches tall with the horn being rotatable. While the church was offered hanging the speaker horizontally, they decided that the speakers would look better placed vertically. In this configuration, it made for a smaller looking cluster with the whole assembly hanging at the same height of the previous speaker system. These loudspeakers had been compared to other well know speaker and each time, the KV2 speakers out performed what the churches had on hand or other speakers they were considering as replacements. The KV2’s sounded better and performed better. It is seamless system that is matched up to an amplifier/processor (EPAK2500R) that is all built by KV2 Audio. They also supplied the cables and connectors. The next major item for the sound system was the replacement of the mixer. The previous analog mixer did a good job but keeping it going was going to cost almost as much as buying a new digital mixer. After a lot of discussion, the church went with the Allen and Heath GLD-80. It is a good sounding mixer with all of the bells and whistle you can hope for in a vibrant church. 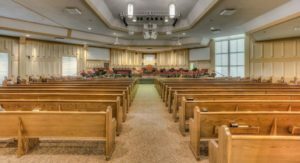 Clair Solutions Designs and Installs New AVL and Acoustics at Oak Cliff Bible Fellowship – Without Ever Missing a Sunday Service! Site Develop by Crescit Software, Inc.